Sub-subtitle: Genetic defects in metabolism can affect the entire body due to lack of essential nutrients. Background: I was found to have eleven of thirty defects in the methylation cycle that were known to be more common in patients with autism spectrum disorder. The screening is not for diagnostic purposes at this stage but is available to consumers interested in the information for their own research purposes (which might include what to feed their child or themselves for better management of autism symptoms – but it is use at your own risk information rather than ‘evidence based’ medical treatment approved for a certain diagnosis). One of my genetic defects affects my ability to break down betaine into the free amino acids glycine and methionine (roughly, I would have to review the chemistry for the specifics). So armed with this new information I ordered tablets of each amino acid and started taking them each day as supplements. They seemed to help but it wasn’t a dramatic change in how I felt. A month or two later before reordering more bottles I considered the question of just how much glycine or methionine I might need each day if I had a defect that prevented me from digesting protein and releasing the essential amino acids. When I looked into how much glycine might be needed by the body each day, I didn’t find much research but there was some and the amount suggested was far greater than the amount I was taking in the form of a tablet — 200 milligram tablet compared to two grams of the essential amino acid as a minimum recommendation with up to ten grams being proposed as possibly beneficial. And no toxicity risks were mentioned. Two grams is equivalent to 2000 milligrams or ten of the tablets each day, which would be expensive and a lot of tablets. Many things that are available as supplements are also available in bulk as a powder that companies might use to make capsules or tablets for the individual consumer to purchase. The amino acids glycine and methionine were available online in a package size that was designed for individual use, possibly being marketed to people interested in body building or weight lifting. A teaspoon of a powder substance is roughly five grams, depending on the density of the powder. I decided to try one teaspoon of glycine and one teaspoon of methionine per day as that would easily provide two grams and might provide up to five grams per day. Results: Free essential amino acids are acidic — like lemonade — but taste a little like protein aka meat, so two teaspoons of free amino acids in water tasted VERY BAD. My nickname for the concoction became “Essence of Meat-ade” for the first day or two, however almost immediately after drinking the vile drink my mood became incredibly cheerful and I was suddenly filled with energy. I was amazed — how could a horrible tasting glass of water change my mood? I started looking forward to the drink and while I had started taking it in the evening I gradually switched to taking it earlier in the day and even twice a day occasionally, which would provide about ten grams of the powder. My mental nickname changed from “Essence of Meat-ade” to “Cheerful Juice,” it helped my mood so much that I loved the stuff no matter how silly my face looked while trying to gulp it down too quickly to taste. I was amazed, and a little sad to consider that I had been without “Cheerful Juice” for my first fifty years of life — but better late than never is a motto of mine. With a double genetic defect I wouldn’t have been able to release glycine or methionine from larger proteins for my entire life — and therefore wouldn’t have had the cheerful effects or boost in energy due to the incomplete digestion of my food. Why would a bad tasting drink give me a good mood? I knew the amino acids glutamine and aspartic acid can act as messenger chemicals within the brain so I looked up glycine and methionine and sure enough they both also can act as brain signaling chemicals. The rest of this information is about glycine’s role as a brain neurotransmitter. It doesn’t cover methionine but it also has roles in brain chemistry. Glycine has inhibitory and excitatory roles in the brain as a neurotransmitter – a type of chemical that can serve as a messenger between brain cells which are called neurons. Background: Glyphosate is chemically very similar to glycine in that it may be incorporated into proteins but is not functionally the same. A protein containing glyphosate instead of glycine would be dysfunctional. Glycine provides methyl groups which are important for turning strands of DNA on and off, (DNA is the genetic material that acts as recipe cards for making proteins). If glyphosate is being physically incorporated within body tissues in place of the amino acid glycine, then the role of glycine within early fetal development discussed in the above excerpt might be part of the mechanism for how autism risk may be occurring during the prenatal stage of life. From a Marketing Perspective: How to sell something that tastes horrible but makes certain people feel great? From my experience working with special need infants and children I learned that sick children when given a formula they can tolerate will cheerfully start drinking the formula if it isn’t making them feel sicker — no matter how bad the formula tastes — and some of them are like “Essence of Meat” because they are based on free amino acids that would be easy to digest and wouldn’t have the same allergy risk as the larger and more complex proteins. So how to market a specialty product? Target the special needs market, and pitch having the genetic screening done first in order to find out who needs the special product — and put the bulk powder in capsules 😉 , I tried to add lemon flavoring to make it more like lemonade but that didn’t change the flavor enough — I’m working on acquiring a taste for it instead. The genetic screening I had done is “For Research Purposes Only” but it was assembled by a specialist with a PhD and experience in genetics. She is not a medical doctor and no diagnoses are provided however some health information is provided I haven’t reviewed it yet and therefore can not provide any feedback regarding it. An excerpt from that post regarding diagnoses that may be helped by use of dimethylglycine (DMG) and methionine as supplements : DMG has been found helpful in ADHD, autism, allergies, alcoholism, drug addiction, and chronic fatigue syndrome among other chronic issues. Methionine has been found helpful in treating depression, allergies, alcoholism and schizophrenia among other chronic issues. 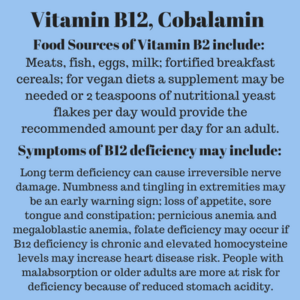 Vitamin B12, Cobalamin, foods sources and possible symptoms of deficiency. numbness and tingling of the arms and legs; problems walking; disorientation; memory loss; mood changes that may resemble schizophrenia; and dementia. Damage may occur to the myelin sheath which surrounds and insulates nerves like the plastic coating around an extension cord. Nerve damage and mental health symptoms may become permanent with long term deficiency of vitamin B12. loss of appetite, a painful tongue, and constipation. The reason for there to be digestive symptoms associated with B12 deficiency is not well understood. One theory suggests that undiagnosed digestive problems might have been an initial cause of the B12 deficiency. pernicious anemia and megaloblastic anemia which are hemoglobin deficiencies that have symptoms of tiredness. 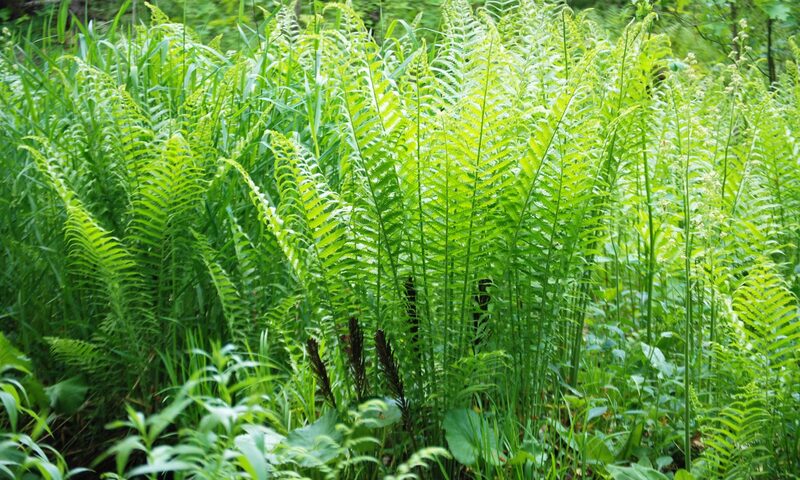 Folate deficiency symptoms are also possible because B12 is necessary in folate metabolism. Increased heart disease risk from elevated homocysteine levels may result from B6, B12, or folate deficiency. Those with malabsorption problems, or people with chronic use of antacids and those who are over age 60. A specific protein cofactor called the intrinsic factor and normal stomach acidity levels are necessary for B12 absorption to be able to occur. Some individuals receive monthly injections of B12 after reaching older age and some people need to receive them monthly throughout life due to having chronically low vitamin B12 for other reasons than normal aging such as a genetic issue with their production of the intrinsic factor protein. Sublingual tablets of the supplement are also available which are absorbed in the mouth, bypassing any problems with the rest of the digestive system. A problem with lower digestive acidity in the stomach could also be managed simply by adding a side dish or condiment to meals that contains vinegar or acidic ingredients. Examples from around the world include chutneys, pickles, lime or lemon juice/fresh wedges, vinegary salad dressing, salsa or Tabasco Sauce, and Worcestershire sauce. What is Worcestershire Sauce? 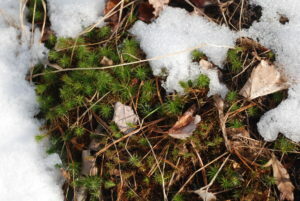 (thespruce) (and how do you spell it? )- It is an interesting story – featuring the chemists Lea and Perrins. (Lea & Perrins is still the best selling brand of Worcestershire Sauce). Who knew chemistry could be so delicious? Probiotics refers to products that contain actual good guy bacteria, while prebiotics refers to foods that contain fiber or other nutrients which the good guy bacteria need to eat in order to survive and flourish – in competition with the more negative strains of bacteria or with yeasts or other microbes which might be found within our gastro-intestinal tract. See the post on Vitamin B6 for more information about how the group of B vitamins work together in energy metabolism and cell growth. Last reviewed and revised on 9/30/2017, graphic added, 5/23/2018. Disclaimer: This information is provided for educational purposes within the guidelines of fair use. While I am a Registered Dietitian this information is not intended to provide individual health guidance. Please see a health professional for individual health care purposes.